The long-tailed macaque is said to prefer to inhabit ‘disturbed forests’. 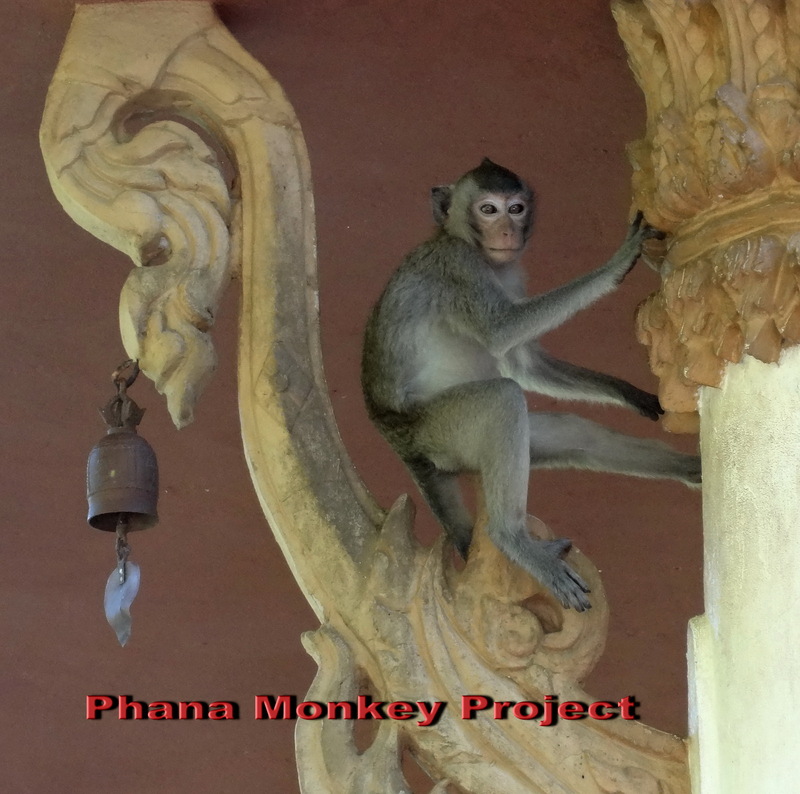 Don Chao Poo, or the monkey forest, here in Phana is certainly disturbed. It has been disturbed by installing four large Buddha images, and paving the sandy paths to them; by widening and concreting some of the sandy tracks, converting them into roads; and by building several toilet blocks and installing water tanks and water troughs. Cars, pick-ups and motorcycles make use of the roads and cause more disturbance. Visitors walk into the forest to feed the monkeys or just to look at them. And the thing is, the monkeys do obviously love all this. When I walk into the back of the forest, to the undisturbed parts away from people, traffic and buildings, there are no monkeys to be seen. Possibly they use this area for sleeping, but I doubt it. When I have seen the monkeys coming down to the ground early in the morning it has always been from trees close to the road. The ceremonies and celebrations held in the forest at certain times of the year are a major form of disturbance. But again, the monkeys seem to love these occasions. Often they stay out of sight while most of the ceremonial activity is going on, but the people who come to the forest and the food they bring with them attract their attention and the monkeys are just waiting for most people to depart and then they start scavenging the left-over food and bags and so on. Just recently the forest has seen the annual retreat by monks, mae chee, and some lay people, about 200 people altogether camping in the forest for 10 days of meditation and Buddhist teaching. 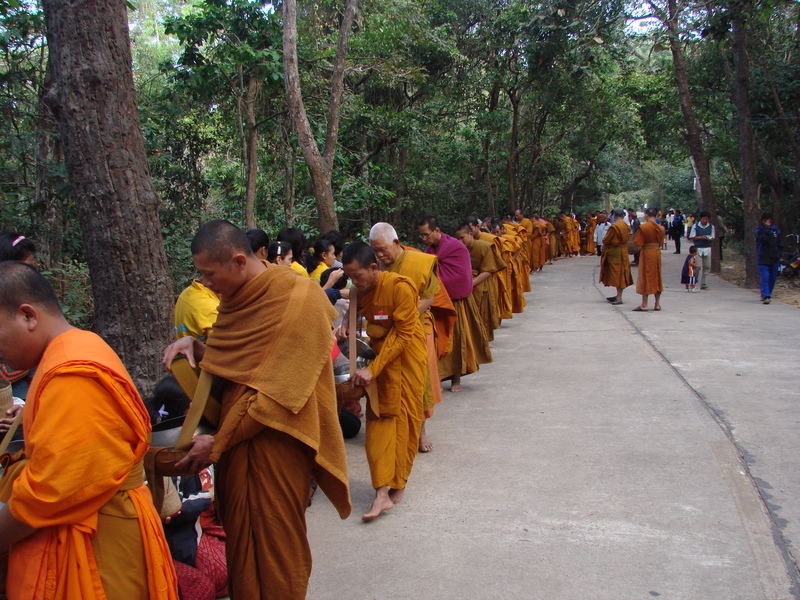 Every morning they go on alms round, and the lay people who offer the food stay to eat a late breakfast/early lunch in the forest. The monkeys stay away but they are alert to any chance to do a bit of scavenging. I took a walk around the ‘Buddha image trail’ with some Thai friends and a young woman from Guatemala who had come to Phana with them. On this occasion there were several monkeys on and around the path, something I haven’t seen before. They were there either because their usual places had been taken over by the monks, or perhaps because there were more humans than usual using the path. 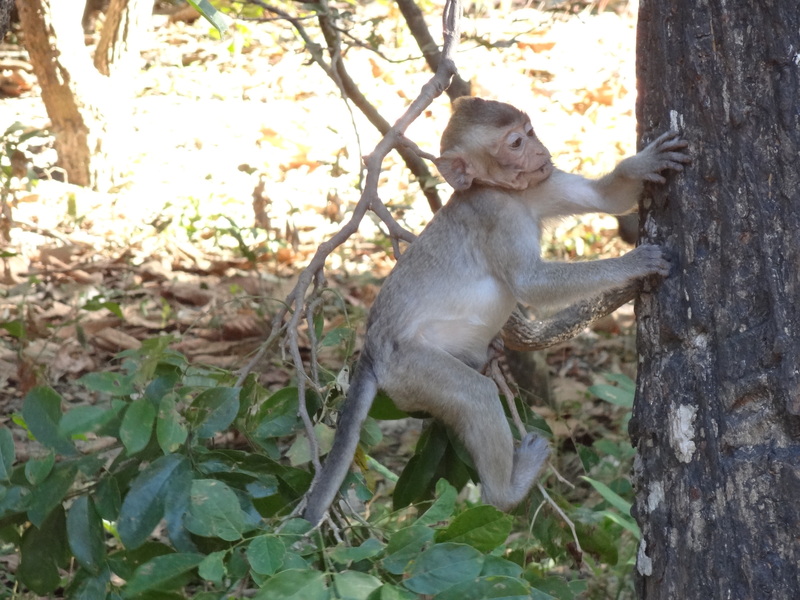 And as well as disturbed forest, long-tailed macaques love to be near humans, in the hope of getting some food, mainly, but also it would seem that they like our company as much as we like theirs. 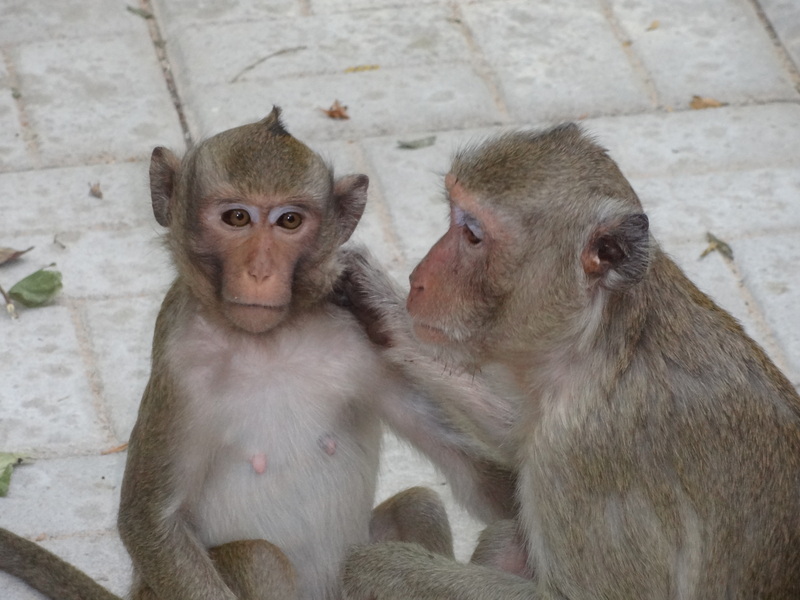 Here are some of the monkeys I met that day. You can click on the images to enlarge them. 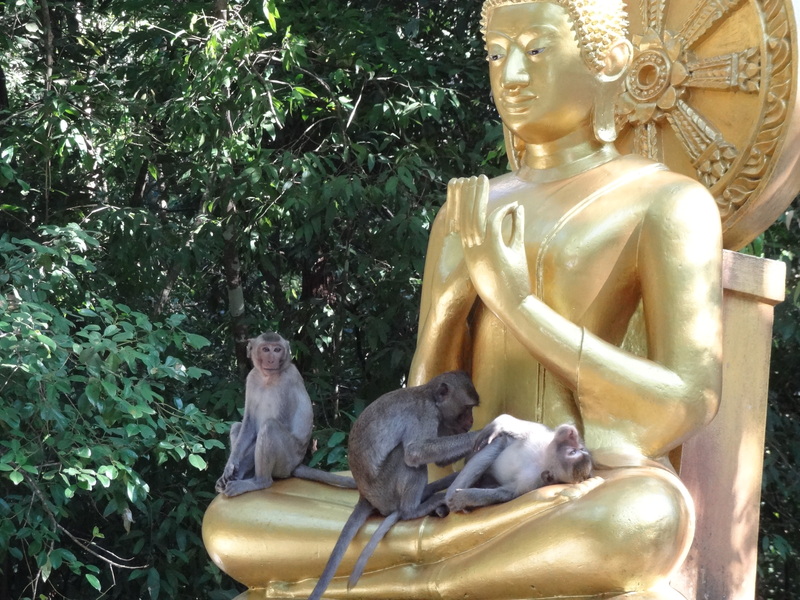 So the forest is disturbed and the monkeys are disturbed, but they seem to take it all in their stride. 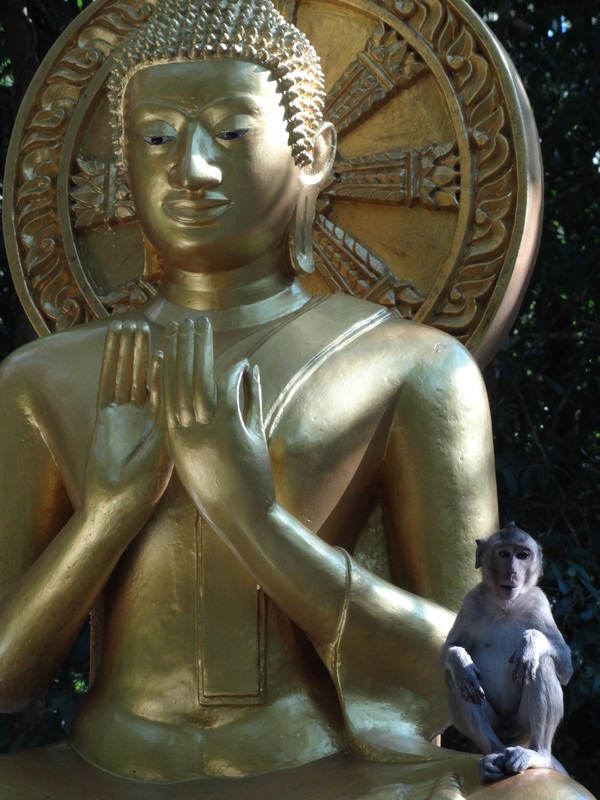 It’s all part of the experience of being a long-tailed macaque in Don Chao Poo Forest, Phana. 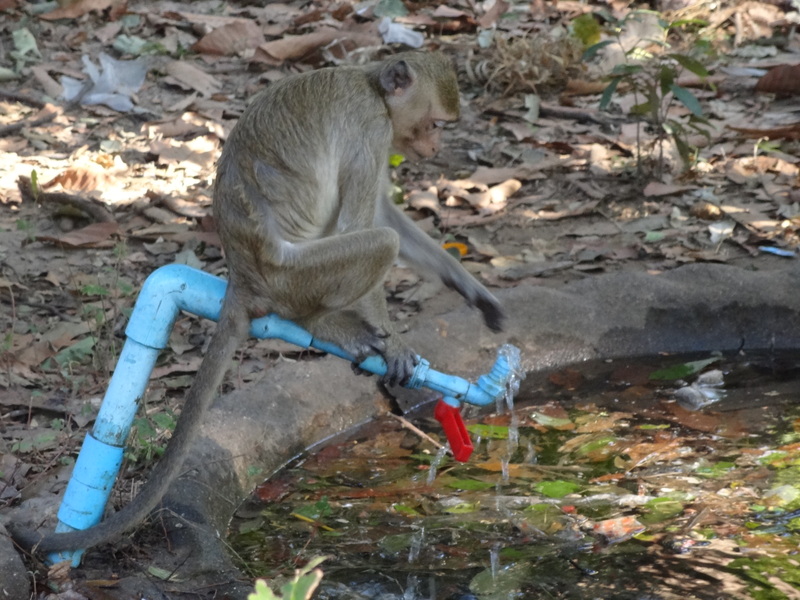 This entry was posted in Ceremonies and Celebrations, Long-tailed Macaques and tagged Amphur Phana, Isan, Long-tailed Macaques, Monkeys, Thai monkeys. Bookmark the permalink. It is very interesting finding about this primate species. But disturbances like fires and or hunting could discourage them to be near thuman.